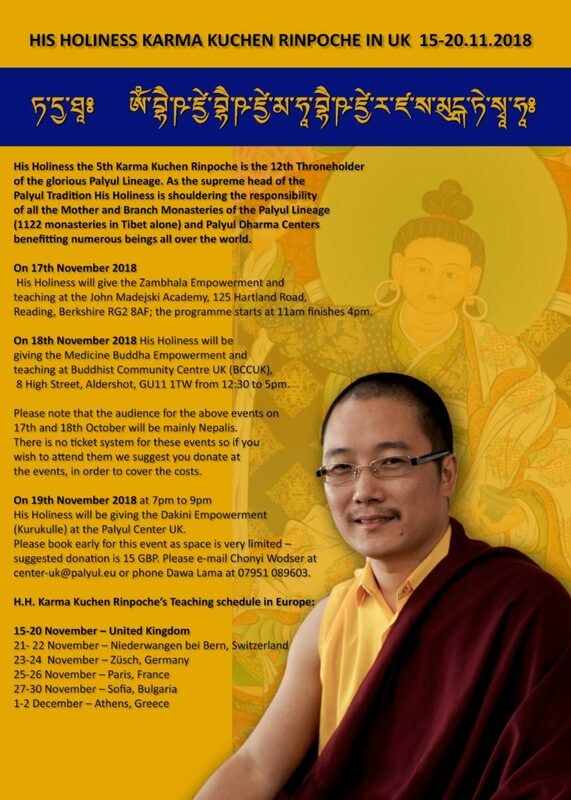 The Palyul Center UK is delighted to announce that His Holiness Karma Kuchen Rinpoche, the 12th throne holder of the Palyul Lineage in the Nyingmapa school of Tibetan Buddhism, will be in the UK from 15-20 November. On 17th November 2018 His Holiness will give the Zambhala Empowerment and teaching at the John Madejski Academy, 125 Hartland Road, Reading, Berkshire RG2 8AF; the programme starts at 11am finishes 4pm. On 18th November 2018 His Holiness will be giving the Medicine Buddha Empowerment and teaching at Buddhist Community Centre UK (BCCUK), 8 High Street, Aldershot, GU11 1TW from 12:30 to 5pm. Please note that the audience for the above events on 17th and 18th October will be mainly Nepalis. There is no ticket system for these events so if you wish to attend them we suggest you donate at the events, in order to cover the costs. On 19th November evening at 7pm to 9pm, His Holiness will be giving the Dakini Empowerment (Kurukulle) at the Palyul Center UK. Please book early for this event as space is very limited – suggested donation is 15 GBP. Please e-mail Chonyi Wodser at center-uk@palyul.eu or phone Dawa Lama at 07951 089603. His Holiness Karma Kuchen Rinpoche was recognised by His Holiness Dudjom Rinpoche as the unmistaken reincarnation of Karma Thegchog Nyingpo, and His Holiness Penor Rinpoche raised him from a very young age – he is the most important of all tulkus that HH Penor Rinpoche has ever taught. Throughout his education he was closely guided by HH Penor Rinpoche, and after he mastered the sutras and tantras, he received numerous empowerments and teachings of Kama and Terma from His Holiness Dilgo Khyentse Rinpoche and HH Penor Rinpoche and many great khenpos and lamas. 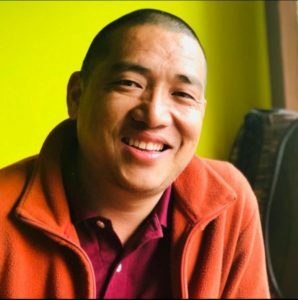 HH Penor Rinpoche is his root Guru, from whom he received the pith instructions of Dzogpa Chenpo from the Palyul tradition. 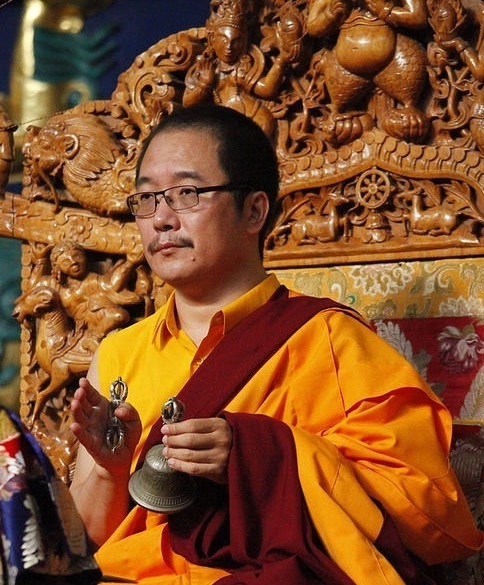 In August 2000, he was formally enthroned as the 12th throne holder of the Palyul Lineage and became the supreme head of all the Palyul mother and branch monasteries. Venerable Khenpo Pem Tsheri Sherpa is coming from New York to translate for His Holiness Karma Kuchen for Nepali audience. The Venerable Khenpo Pem Tsheri Sherpa graduated from the Ngagyur Nyingma Institute (Shedra) which is part of the Palyul Namdroling Monastery in Bylakuppe, South India. Currently he lives in USA.